Yup, you can get some serious symptoms from using infected or contaminated makeup. 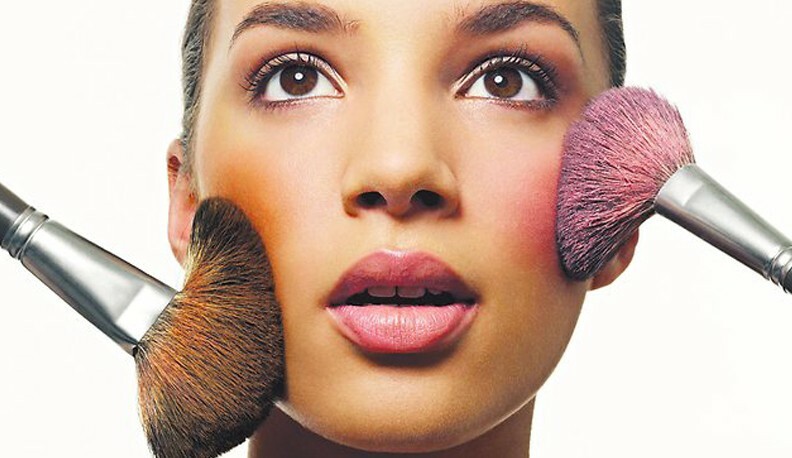 Bad makeup can wreak serious havoc on your body, and it can really make you sick. There are lots of jokes about how we have to suffer for beauty, but you shouldn’t mess around with old makeup. So, I wanted share these 8 telling signs your makeup is making you sick so you can keep a look out for symptoms of makeup gone bad! Skin irritation is an easy symptom to detect if you’re wearing the wrong makeup, but sometimes the culprit is something else that’s beauty related and not our makeup. Give up? It’s perfume! Perfume is the #1 cause of skin problems for women so next time your skin feels irritated, check and see if it’s in areas you spritzed with perfume and abstain from using it for awhile to see if skin clears up. You’re definitely using the wrong makeup if you’re experiencing itchy or irritated eyes. Pink eye or conjunctivitis is common in those who use expired or infected eye makeup. A huge no-no is sharing makeup and/or grabbing and using makeup testers off of the store counter. If you want to sample something, try to use something that’s a one-time use applicator and has been properly sanitized. A sure warning sign of bad makeup is sullen-looking skin. If you’re using old or bacteria-infested powder or foundation, your skin can end up looking very dark and it will appear almost like you’re sick. Toss any powder makeup after 2 years or liquid makeup past 6 months and avoid leaving them in warm and humid areas. Keep in mind that everytime you touch your cosmetics or your skin, you could be transferring germs! Another symptom of makeup gone bad is having fluctuating moods and feeling like your hormones are on a roller coaster. It’s strange how your personality can be affected by makeup, but it’s not unheard of. Mercury in cosmetics can cause all sorts of strange symptoms that you might not associate with using bad makeup but it’s very real and very dangerous. Be sure you do your research before buying makeup. If you start noticing hair loss, it might be a symptom of using the wrong makeup. If you notice hair loss in conjunction with other symptoms on this list, it’s very likely that you’re using the wrong makeup and it’s making you sick. Metals in makeup are to blame for this symptom. Per the FDA, they don’t regulate premarket products except for color additives, so that means that they don’t approve makeup prior to going on the market so don’t assume all makeup is safe! Another sign of using contaminated makeup is memory loss. This symptom can be caused by mercury or other metals which have been found in numerous beauty products around the world. Mercury poisoning can prevent a person from learning something new or prevent them from remembering something that has to be memorized. Metals in makeup have been linked to lifelong impairments and birth defects. Another red flag of using the wrong makeup are tremors and twitching as well as headaches and vertigo. The guilty party here is mercury and being that it’s totally odorless, colorless and tasteless, there’s no way to detect it on your own. Even reputable companies have been guilty of including mercury and other metals in their products so it’s best to do your research before buying. The last sign of using the wrong makeup is developing symptoms of anxiety and depression. As mentioned earlier, metal poisoning can cause a variety of symptoms that you wouldn’t normally associate with bad makeup. Some cosmetics companies defend their use of metals stating that the amounts of metals are miniscule but using any product containing metals over a long period of time is unsafe. I hope you never recognize any of the symptoms of using the wrong makeup! Metals and contaminated makeup are scary and not as uncommon as we’d like to think! Research the beauty products you buy and be aware of any changes in your skin, hair or emotional well-being. You can never be too cautious or careful when it comes to your body! Have you ever experienced any problems with certain brands of makeup?